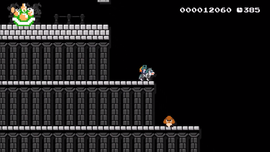 Twilight Princess HD is an Event Course in Super Mario Maker, released on March 9, 2016, and based upon The Legend of Zelda: Twilight Princess HD. It unlocks the Wolf Link Mystery Mushroom costume upon completion. The level begins with a mess of blocks, along with a warp pipe. It leads to an area meant to represent a dungeon, with many secret ten-coin Brick Blocks scattered around the area. After an encounter with Bowser Jr., the Checkpoint Flag is reached, along with another warp pipe leading to an area with Fire Piranha Plants and Koopa Troopas. Another warp pipe follows, along with another encounter with Bowser Jr., this time in his Koopa Clown Car. After defeating him again, a warp pipe takes Mario to the second Checkpoint Flag. After climbing a tower-like block structure, Mario will encounter a Shoe Goomba along with another warp pipe, leading him to a big winged Bowser Jr. and some Goombas. After heading right to another warp pipe, Mario will reach the Goal Pole. This page was last edited on January 31, 2019, at 00:32.